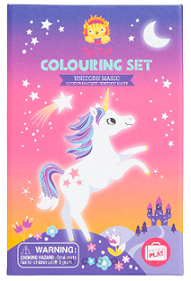 Each set contains: 48 colouring-in pages 2 handy storage drawers 5 sheets of gorgeous full-colour stickers 10 quality markers. 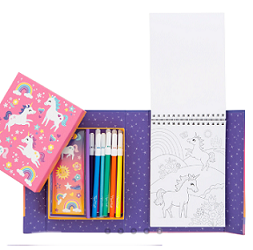 Everything you need in one self-contained box, with a magnetic flap to keep contents safely stored.For hours of creative fun. Great for Cafe play, portable toy - perfect for travel.